Hmmm...ultra salty chinese takeout? 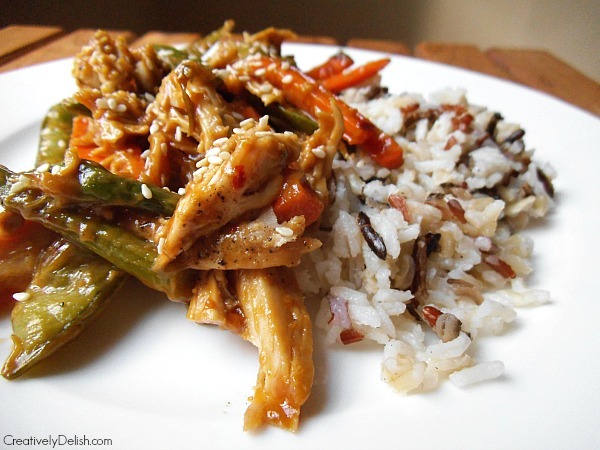 Orrrrr super simple, extra savory, more delicious than you can possibly imagine, Sesame Peanut Chicken with Roasted Vegetables & Rice...it's an easy choice! When you want to indulge in take-out, it can be so easy to just pick up the phone, order your food and it magically lands on your front door step twenty minutes later. It's convenient I know, but with the amount of sodium, MSG's and extra fat that lands in that plate of noodles, you can't really be certain you're enjoying something nutritious. That's why I made this the other night. I was craving some serious Asian cuisine but refused to dole out the big bucks for something less than nutritious. The sauce is made up of a simple mixture of chunky peanut butter, low-sodium tamari, toasted sesame oil, lime juice, red pepper flakes and honey for a touch of sweetness. I make this sauce a lot and use it for lettuce wraps, over rice as shown, in a salad, made in to a pasta dish (like a lo-mein). It's a healthy, high protein, healthy fat sauce that adds zest and flavor. 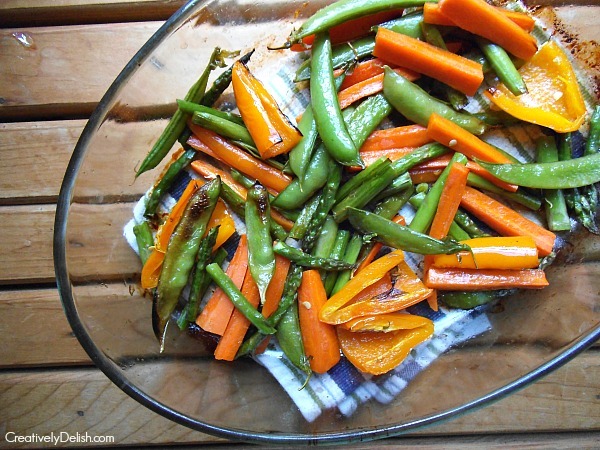 You can seriously reduce the amount of oil used to roast vegetables versus sauteing them, while roasting them also brings out the true flavors of the veggies, giving them a slight crispiness to the ends and a caramelized effect that makes the veggies melt-in-your-mouth good. Simply heat the oven to 400, line a baking sheet with tin foil or use a baking dish (pictured above), cut up whatever veggies you prefer, coat them in a scant amount of olive oil, then cook, stirring once, for 30-45 minutes. 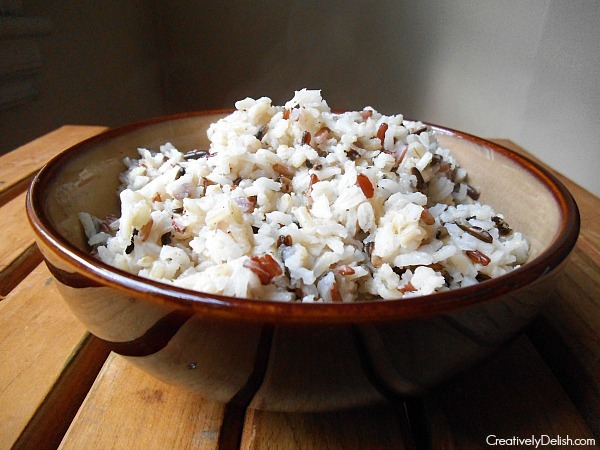 I chose a brown and wild rice mixture, however any type of brown, basmati or jasmine rice would be great for this dish. The wild rice in this give it a slightly nutty taste while the brown rice soaks up all those delicious peanut sauce flavors. 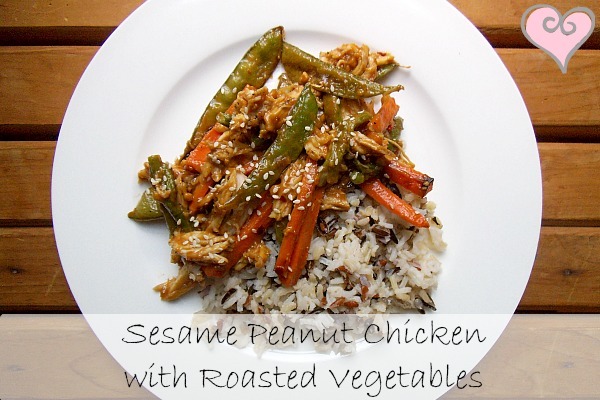 Healthy, nutritious and super easy to make! 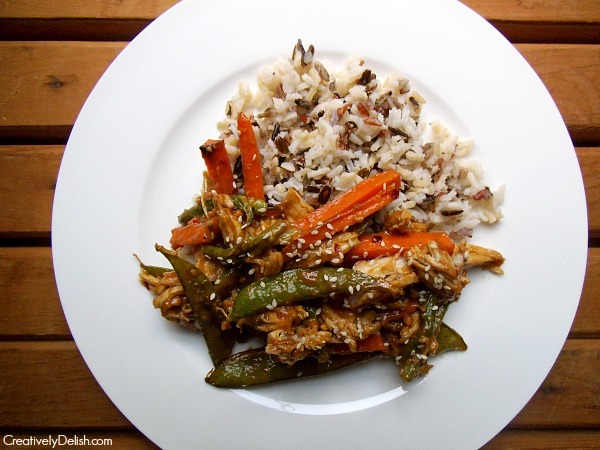 Combine the first six ingredients in a bowl, then pour over veggies and chicken. Stir to combine, then serve over rice.